banner photo: Start of the 2017 Shenendehowa Veterans Day Dash. Island Spouter and Geyser Creek at the 2017 Fall Back 5. The races sandwiched between Halloween and Turkey Trots recognize our military veterans, get you out on the fall trails, and inspired with Girls on the Run! With heat and humidity long gone, the cool air is a runner’s dream! In addition to the popular Stockade-athon 15K on November 11 in Schenectady, here are some must-do races for early November. Support and honor our nation’s military veterans at two races that benefit and recognize their service and sacrifice. On Saturday, November 3, the seventh annual Revolutionary Run for Veterans 5K Run/Walk will start at Fort Hardy Park in Schuylerville and traverse the historic towpath north and across the canal to Hudson Crossing Park. Following a gentle loop around the Hudson Crossing Park field, the course then enters the nature path along the Hudson River. The course takes you past the Champlain Canal Lock C5 in the Hudson Crossing Park. In 1777, British General John Burgoyne led several thousand British and German soldiers across the river at this location to engage American forces on his quest south to conquer Albany. On Monday, November 12, school is out and for some it’s a work holiday so come out to honor our vets at the 11th annual Shenendehowa Veterans Day Dash 5K Run/Walk. Starting and finishing at the Shenendehowa High School track, this race takes you through the school campus and back to finish at the track. The course is flat and closed to traffic. The Shen Runners come together to support the race and all Capital Region runners/walkers are encouraged to participate! Set your clocks back an hour, and with that extra hour of sleep, run this trail race refreshed and ready to go! Try the 12th annual “Fall Back 5” 5-Mile Trail Race on Sunday, November 4 at the Saratoga Spa State Park. This will be the fourth year that the fall classic will be hosted by the Saratoga Stryders running club. Participants will traverse the multi-terrain course that will take them from the starting line on level grass on “The Quad” to the park’s well-known and not-so-well-known landmarks, such as the Island Spouter Geyser and the Orenda tufa, while running along the Geyser Creek. Climb and descend steep trails with hairpin turns, and pass over the lesser traveled Wetlands Overlook Trail. The race is described as nature’s original obstacle course at its finest. 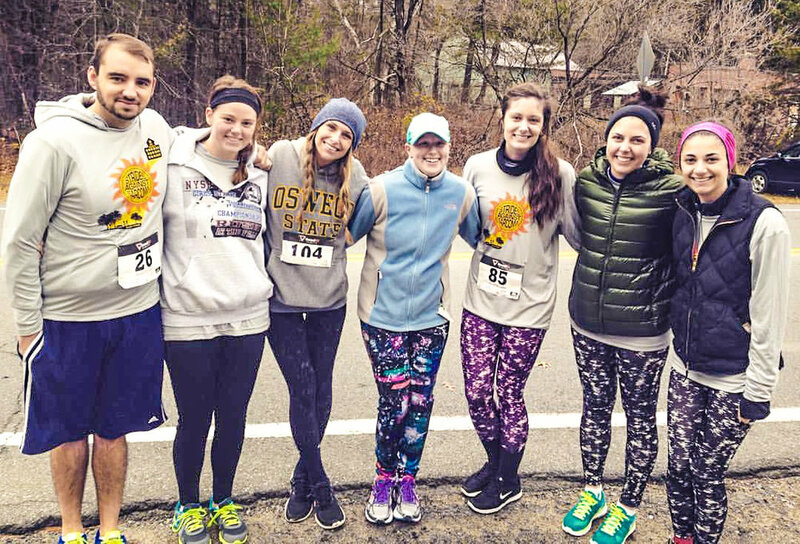 Caroline Savitz (center) founded Strides Against Sarcoma in 2015. On Saturday, November 10, the fourth annual Strides Against Sarcoma is a 3.5-mile point-to-point trail race from the Rush Pond Trail to the Queensbury XC Trails at the school campus. The first two miles consist of hard packed cinder with rolling hills. There is a short singletrack section leading to the Queensbury trails. Joyful finish at 2017 Girls on the Run 5K. Finally, support school-age girls’ running at the Girls on the Run 5K on Saturday, November 17. The starting and finishing line is at a new location this year, the Mohawk Harbor in Schenectady! The certified 5K runs on the bike path along the Mohawk River and around the new river complex. Runners or walkers are welcome and can register as part of a team or create a team. The race is not just for girls; men and boys are welcome.